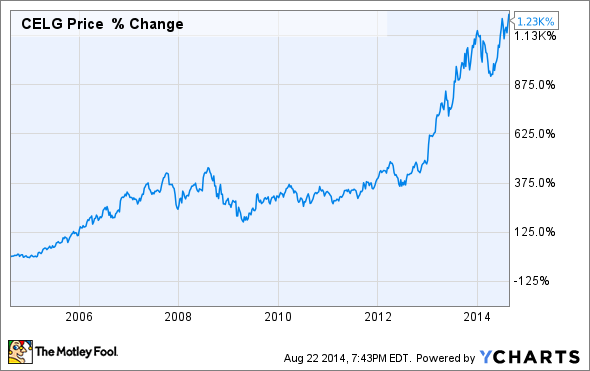 Celgene shares are up more than 1,200% over the past decade. But these three headwinds could be the brick wall that sends its stock lower. If you've been a long-term shareholder in Celgene (NASDAQ:CELG) stock you have very little to complain about. The company's core drug, Revlimid, a treatment for blood-borne cancers, has grown into what's expected to be a $5 billion blockbuster this year, and Abraxane is on pace to receive a number of new indications in the upcoming years. The result, as you can see below, is more than a 1,200% return over the past decade. But as investors we're also trained to be realists as well as skeptics. As much as we enjoy when stocks head higher, we also know that no stock can go straight up forever. Headwinds exist against all companies, and investors need to be aware of those headwinds in order to fully understand a stock. Celgene is currently facing headwinds, which have the potential to send its stock lower. But investors likely wouldn't know about these challenges because they're just scratching the surface of what's going on at the company by reading its quarterly earnings reports. That's why today we're going to dig deeper and highlight three catalysts that could send Celgene's stock lower. Of course, as you read this bearish thesis, keep in mind that just because headwinds do exist that doesn't mean Celgene stock will head lower. The stock market is a two-way street and companies have just as much of a chance of moving up as they do down. It's the collective sentiment of investors that ultimately determines where a stock is headed next. Revlimid may be a rapidly growing cancer drug, and it's a key reason Celgene has seen its share price head higher. But when push comes to the shove the company is far too reliant on one drug for the majority of its revenue -- and that can be dangerous. In the second quarter Celgene reported $1.85 billion in net product sales, of which Revlimid comprised $1.21 billion. To add some context, Revlimid was responsible for 66% of Celgene's product revenue in Q2. The recent approval of Otezla for psoriatic arthritis and expanded indications for cancer drug Abraxane should shift this percentage a bit lower. But even so, I'm not certain it'd drop below 50% of Celgene's annual revenue within the next couple of years. It's possible Revlimid will continue to grow and both Celgene and shareholders reap the benefits of that growth. But two factors could stand in the way of that: competition and favorable pathways now being offered by the Food and Drug Administration. While a pillar in the multiple myeloma treatment landscape, it's possible that Revlimid could be facing competition from Amgen's (NASDAQ:AMGN) Kyprolis in a second-line indication if approved by the FDA in the U.S. and European Medicines Agency overseas. Also, AbbVie's (NYSE:ABBV) and Bristol-Myers Squibb's (NYSE:BMY) elotuzumab could pose a problem as a second-line therapy. Though elotuzumab is given in combination with Revlimid and a low-dose dexamethasone, going from a Revlimid-based maintenance therapy to something where Celgene is now splitting revenue as a combo therapy could slow its growth potential in the advanced multiple myeloma setting considerably. Also keep in mind that elotuzumab received the breakthrough therapy designation from the FDA in May. The other problem here is the FDA has introduced the breakthrough therapy designation to expedite the development and potential approval of life-altering drugs. This expedited pathway has the potential to bring new drugs to market faster, like elotuzumab, which can eat into Revlimid's growth potential. Not to beat down the Revlimid door again, but since Celgene relies on Revlimid for so much of its annual sales, it needs to keep a tight lid on the patents that protect it from generic competition. Under normal circumstances drug developers are issued patents that protect a drug for 20 years. The clock on these patents usually starts ticking the day the FDA approves a drug to begin human clinical trials. Therefore, once a drug has gone through clinical studies and received an FDA approval most have around a decade of exclusivity, give or take a couple of years. Celgene, however, has been vigorously defending its Revlimid patents against the likes of Natco and Mylan (NASDAQ:MYL), which have filed suits against Celgene in order to bring generic versions of Revlimid (known as lenalidomide) to market. Wall Street seems to believe that Celgene has the upper hand in the current Natco suit, but if we've learned anything over the years it's that the rulings by the FDA and/or legal courts aren't predictable and can never be taken for granted. Anything is possible when it comes to patent extensions or retractions. If Celgene were to lose its court battles with Natco or Mylan it would either see Revlimid sales plummet since generics are often about 90% cheaper than the innovator drug, or it would likely have mammoth settlements to make to each company to keep them on the sidelines until Revlimid's patents were expected to begin expiring, which in the U.S. is 2027. Either way, no ruling has been issued in the Natco case as of this writing, and it could be a very negative headwind if the court finds in favor of Natco. Finally, skeptics are likely to hone in on the fact that Celgene's shares have more than doubled since CEO Robert Hugin introduced five-year guidance in 2013 that spelled out a doubling in revenue through 2017. The result of this extraordinary run higher in Celgene's stock is a company valued at close to 30 times trailing earnings and 19 times forward earnings. That may not sound too bad when you consider the compound growth potential behind those numbers, but its trailing P/E is markedly higher than the S&P 500's current P/E of 19.7. Also, as Celgene President of Hematology and Oncology Jacqualyn Fouse said during the company's conference call with respect to when a dividend might be considered, "It's a ways out." Celgene is far too busy reinvesting in collaborations and its own pipeline, and has far too little diversity within its existing products, to consider a dividend at this point. The concern with that thought process is that dividends provide stability. I don't think anyone would question that Celgene is going to stay cash-flow positive at this point. Instead, it's a matter of stability when the U.S. stock market does begin to swoon. As we know, markets don't go up forever. Without a dividend and sporting a higher P/E ratio than the benchmark S&P 500, it's possible that Celgene's downside move could be considerably larger than the benchmark indices when this stock market rally does end. As we saw last week Celgene has a lot of factors working in its favor. But as we've pointed out this week there are a number of concerns and risks that investors need to come to terms with as well that could send Celgene shares noticeably lower. These are factors that should be chewed on and carefully weighed by current shareholders and on the fence investors.